Below is a listing of articles on file. Click on the article title below to view the article. why is the roof on the club house being replaced yet again? 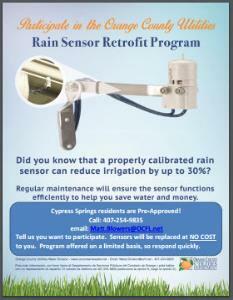 Click here to view the rain sensor retrofit program flyer. This is free to all owners in Orange County, Florida. What you haven't heard and what has changed about solar energy. I know that Belair homes is out of business, but recently while having my home repaired and getting rid of all the rotting wood siding. I found out that the siding is nailed on to the roof braces and that there is no wood under neath. No wonder these homes are so drafty. But would any one know if there is any thing that can be done How did these homes pass inspection in the first place, when they were never build correctly? Can we go after Orange County or anything, I see this as a class action law suit. This is not the only community they build here in Central Florida.